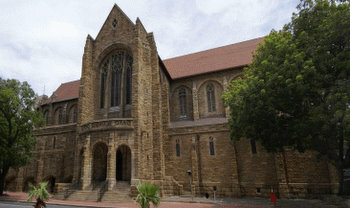 St Georges Cathedral stands at the southern tip of Africa, but its architecture and style of worship points to its Anglican heritage. The daily round of worship and the prayers maintain this place as a focus of worship and draw people of all walks of life into this space. Ever since the arrival of Bishop Gray in 1848 there has been a sustained effort to maintain the cathedral's standard of music. 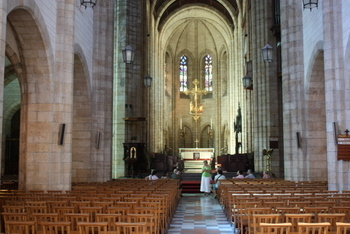 The liturgical performances of the great orchestral masses by composers such as Haydn, Mozart, Schubert, Beethoven, Bruckner and Stravinsky have become an important part of the cathedral's music tradition. Full choral evensong is sung on Sunday evenings. 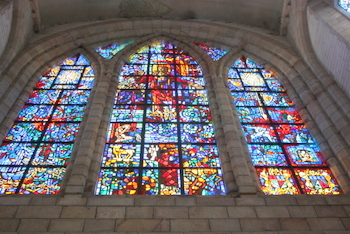 St Georges Cathedral is fortunate in having some fine Gabriel Loire windows. The ten bells are rung at occasions both joyful such as weddings and sad such as funerals, as well as important civic events. The Cathedral ringers are always ready to welcome new or visiting ringers. The shop is across the car park from the church, facing Queen Victoria Street. Come and browse for books of all kinds, interesting bric-à-brac, antiques and collectibles, paintings and pictures, CDs and old records, and the occasional small piece of furniture. Proceeds from the shop support Cathedral activities, the Cathedral music fund, and selected external outreach ministries. Return from St Georges Cathedral page to Homepage.